The Nissan Qashqai was the fourth biggest selling car of 2017 in the UK, after the Ford Fiesta, Focus and Volkswagen Golf. Its strong sales have continued into 2018, with over 30,000 models shifted in the first six months, proving it to be a hit with many drivers. 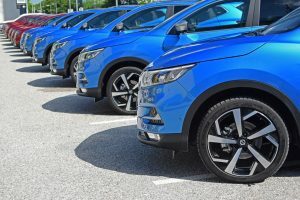 Into its second generation, since the compact crossover SUV was first produced back in 2006, there are nearly half a million of Qashqai owners on our roads. It’s the most successful model in Europe in Nissan’s history. Whether you want yours looking and performing at its best or are planning to sell your Nissan Qashqai in the future, we’ve got some tips to care for your compact SUV. Regularly cleaning your Nissan Qashqai will keep it looking its best and also prevent long-lasting damage from dirt. Cleaning it by hand is also a good opportunity to check it over for minor damage. Get any scratches or dents sorted before they develop into bigger problems. Once you’ve washed it with clean water and car shampoo, hose it down and dry off with a chamois leather cloth or microfibre wash mitt for the best results. If you’ve got alloy wheels then using specialised alloy wheel cleaner and a brush to get rid of a lot of built-up dirt is advisable. Paste or liquid wax can then be applied to protect the paintwork and add that extra shine to your Nissan Qashqai. Stay safe on the roads, and help get the best price when preparing your Nissan Qashqai for sale, by regularly inspecting your tyres so they don’t fall below the legal tread limit and switch when necessary. As long as they’re legal, buyers (both private and dealerships) will take this into consideration and use as a negotiation point on price. The exact size you need will depend on your model, so it’s best to check against the tyre(s) you’re taking off, which you can see on the tyre’s sidewall. It’s advisable to stick to what’s fitted originally when replacing the tyres on your Nissan Qashqai, with many new models coming with Bridgestone tyres, so this can be a good place to start. Whatever your budget, there will be a range of new tyre options available. If you want quality that will last, consider well-known manufacturers such as Michelin, Pirelli and Continental. There are currently five trim levels on offer (the first generation included the N-tec in place of the N-Connecta but no Tek+). This starts with the entry-level Nissan Qashqai Visia, which comes with a cloth trim, as does the next level up, the Acenta, except its steering wheel includes a leather finish. The N-Connecta comes with a seven-inch touchscreen that will need fingerprints wiping off it. Older models with the N-Vision spec include a part-leather trim, while the latest Tekna models have a graphite leather trim. Vacuum the inside first before cleaning the seats and making sure you get into all the hard to reach areas. Don’t forget your glove box and other enclosed compartments. If your car has leather trim, apply a specialist seat cleaner then wipe down with chamois leather and enough water to remove all the cleaning agent. Leave it to dry naturally for the best results. Don’t forget to clean the inside of your windows too, using glass cleaner and a soft, dry cloth. With any car it’s essential that you regularly check and change your oil when necessary. Cars can get through up to a litre of oil every 1,000 miles, so it’s important to measure the level at frequent intervals. Check the handbook to see what specification of oil to use, or speak to your nearest Nissan dealer for advice and they’ll be able to recommend the right option. In most cases this will be the official Nissan Motor Oil, designed by Total, which is aimed at enhancing the protection, performance and longevity of your Qashqai. This chart advises the best motor, transmission, brake fluid, coolant and more for each individual Nissan Qashqai model. Whenever you see a warning light in your Nissan Qashqai you should get it checked out as soon as possible. If you’re not sure what the light means, check your car’s handbook. Ignoring faults can result in problems worsening and becoming costlier. Over half of all registered Nissan Qashqais are diesel models, with those produced since 2015 featuring a diesel particulate filter (DPF). If you only use your diesel Nissan Qashqai for short journeys then blocking of the filter can become an issue. Ignoring the warning light and this issue can prevent the car from running, so always get it checked out. If you’ve looked after your Nissan Qashqai well and are thinking of selling it, our car valuation tool can show you how much it’s worth. Otherwise, these tips should keep your crossover SUV running like a dream.